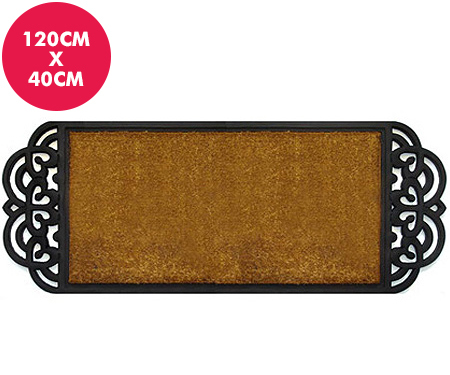 This substantial doormat has a simple, natural coir centre with a pretty rubber pattern detail at each end. Measuring 120cm long by 40cm wide, this long door mat is perfect for patio doors or French doors. Our coir door mats are thick and, made from natural coco fibres, have excellent scraping properties. Tough, durable and well-made, these doormats will add the perfect decor touch to your entrance while also being superbly practical. The colour penetrates deep into the coir fibres for a longlasting finish and years of enjoyment. *Note: These long door mats are bulky items and need to go by courier. We will contact you if additional bulky item shipping charges apply to your postcode.